Béatrice Coron doesn’t so much tell stories, as cut them. 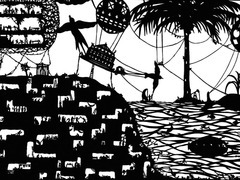 Béatrice Coron: Stories cut from paper At TED2011, the French-born artist shared how she creates intricate, fantastical worlds by slashing paper into beautiful silhouettes. During a party at TED, held in the rotunda of Long Beach’s Aquarium of the Pacific, Coron ran into James Stewart, the Canadian film director who pioneered digital 3D technology. Earlier that day, he’d given a talk at TED University about the art of 3D storytelling. “I’d seen her talk and she had seen mine,” Stewart tells the TED Blog. “I said to her, ‘I love your work. Let’s make a 3D film together.’” And so they did. Today, Coron and Stewart are premiering their collaboration — which has shown at 15 festivals and events, including TED2013, and which is being submitted for Oscar consideration in the Animated Short Film category — online. Called Daily Battles, the film features Coron’s signature cut paper, brought into a moving, 3D environment. The full papercut of Daily Battles, which has been rendered in 3D in the short film above. This film is the culmination of two years of collaboration. After TED2011, Coron and Stewart met in New York to talk about how to work together, a discussion that unfolded over the course of a full year. They decided to begin with Coron’s existing papercut of Daily Battles, and to create a path through the many stories told in its windows. Coron recreated the papercut as a digital vector file and, from there, the pair experimented with different animation styles and backgrounds, eventually opting for full stereoscopic 3D. Kennedy Zielke was called in to animate movement to scenes, and to figure out the transitions between them. Meanwhile Matthew Hemming added depth, color and 3D compositing. And Simon Edwards created a soundscape for the piece. Below, watch the making of Daily Battles. Here, see Stewart’s TED University talk, “Storytelling in the Next Dimension,” about the art of 3D film. It has wonderful relevance now, considering the recent success of Gravity 3D. Read more about James Stewart and the Geneva Film Co., or follow him on Twitter @jamesstewart3D. James Stewart, behind the camera. Read more about Beatrice Coron’s work, or follow her on Twitter @cutstories. Beatrice Coron, in front of one of her papercuts. Watch Coron’s recent talk at TEDxCapeMay, in which she speaks about her latest work. And take a look at the Daily Battles film poster. This… this is absolutely wonderful. Well done and quite amazing if I may say so.